waitress, Mya, is still good for business, locals have appreciated open red oak BBQ grilling, “Santa Maria Style” since the Ostini Family opened the original Hitching Post Restaurant in nearby Casmalia, CA in 1952. The in-direct open fire grilling method, rather then closed smoker, seems to generate great flavor in everything from filet mignon to salmon. The Hitching Post II also has its own house wines with a much different story than one might imagine. 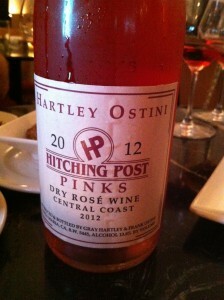 Several years ago, I met Gray Hartley at a tasting event when he was promoting Hartley-Ostini Hitching Post Wines. Experience tells us to be cautious when restaurants, especially BBQ restaurants, begin to make their own house wines, especially Pinot Noir. Fortunately, we can all throw caution to the wind. Beginning as a hobby, Hartley-Ostini Hitching Post Wines is a long-term business and personal partnership between old friends who are now serious winemakers creating fine wines from many of the top vineyards in the region. gear, moving fresh grapes from trucks through the initial crushing process. Hartley oversees the production of 17,00 0cases annually, but he was as excited as we were to watch the grapes come off the trucks and to visit the scales before the fruit was loaded onto conveyor belts, drawn through crushers and de-stemmers before resting in holding tanks awaiting a winemakers touch. 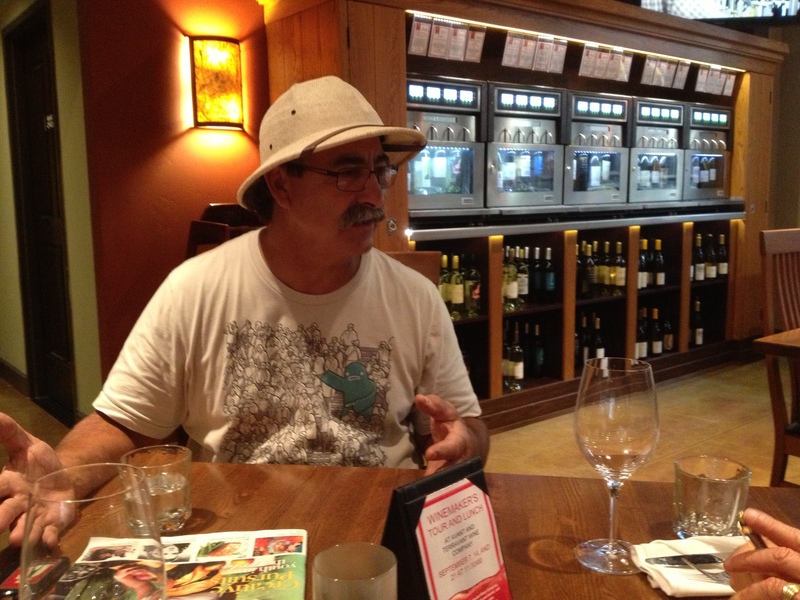 When asked what makes him a good winemaker, Hartley pauses for an instant before responding, “Frank.” High school friend, Frank Ostini convinced him in 1979, to leave his fishing business in Alaska to pursue the dream of creating pinot noir and other varietals that people would want to drink, inside or outside the restaurant. A self-described romantic, Hartley depicts his partner as analytical and pocessing scientific approach, providing a good balance. 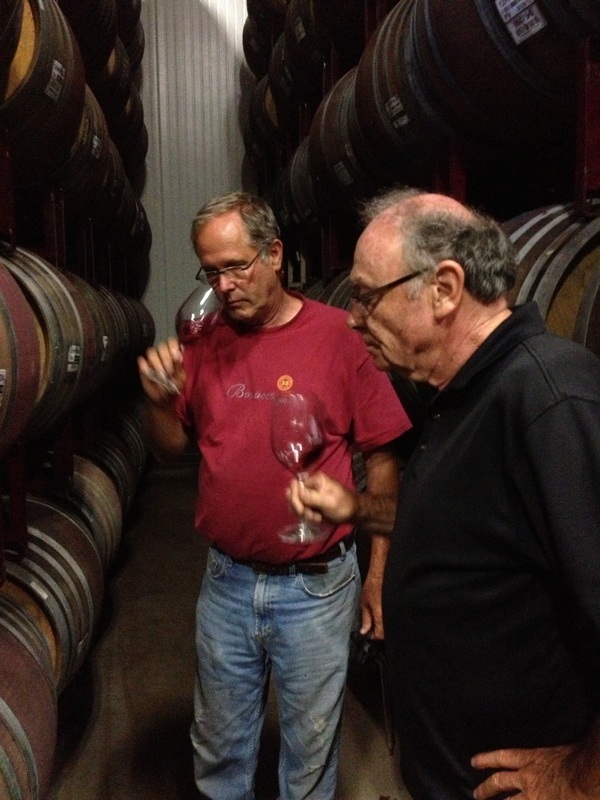 Speaking of balance, Gray pours a glass of the new 2012 Hitching Post “Pink’s” Dry Rose, comprised of valdiguie (48%), Grenache 47% and Pinot Noir (5%). Valdiguie, also known as Gros Auxerrois is a grape native to the Languedoc-Roussillon region of southern France, near Provence, that is producing fine rose’. While the “Pink’s” in the name refers to the salmon that Hartley used to fish in Alaska, the flavors and texture of this rose’ would pair nicely with the Hitching Post II BBQ Sautéed Mushrooms or Grilled Artichokes with Smoked Tomato Pesto. extraordinary vineyards. 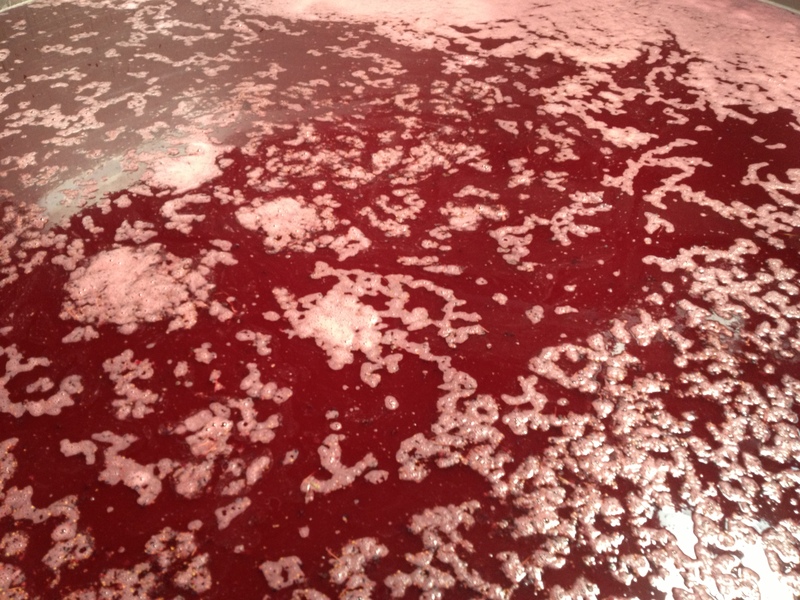 It expresses complex fruit flavors and should drink well for 5-6 years. The popular “Highliner” and other Hitching Post Wines are exported to 12 states, Japan, Denmark and Canada. While most Hitching Post wines spend 18-20 months in the bottle before release, the 2008 Hitching Post “Hometown” Pinot Noir ($20)) was released after only 10 months, appealing to those who prefer the flavors and texture of young, value-priced pinot noir. Frank and Gray both emphasize the need to keep flavors in balance; the flavors must be strong, but not dominant. They aspire to create the Burgundian-style, food friendly pinot noir that can accompany all food including beef. for the 2008 Hitching Post “Perfect Set” Pinot Noir (55) to pair with my fresh Grilled Salmon. This pinot represents the best barrels from Fiddlestix Vineyard in the Santa Rita Hills appellation. As with grapes for her own Fiddlehead Cellars, owner/winemaker Kathy Joseph’s meticulous work in the vineyard has put her stock in demand by winemakers throughout the region. The “Perfect Set” is aromatic, earthy wine with full fruit flavors, living up to its name. The Hitching Post Wines portfolio include single vineyard pinot noir from four of the area’s renown vineyards including the Fiddlestix and Cargassachi Vineyards in the Santa Rita Hills and Julia’s and Bien Nacido Vineyards in Santa Maria. Research will show that many of California’s fine pinot noir releases source fruits from these vineyards. The 2009 Hitching Post “Bien Nacido Vineyard” Pinot Noir ($42) expresses luscious, deep flavors with fully ripened, concentrated fruit. experience, were at the forefront of food and wine pairing. With “no pretense,” they continue, since the first vintage in 1984, to use a “holistic” approach to winemaking and food preparation that helps maintain a healthy balance with each. For those seeking heavier wines to pair with the wonderful open-fire flavors of beef, lamb and pork, the 2010 Hitching Post “Big Circle” Syrah ($24) and the 2007 Hitching Post Syrah “Alisos Vineyard”($30) are both good alternatives. The “Big Circle” expresses complex, balanced flavors and an acidity that makes it very food friendly. One of the fascinating features of California wines is the multitude of human stories of people, their passion, desire and commitment to perfection. 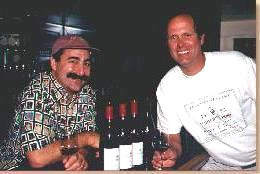 Although the winemaking passion of Gray Hartley and Frank Ostini has become a $2 million annual operation, luckily they still see themselves as two friends making wine in their garage. Their allegiance to “trust the vineyard, trust your senses and share knowledge” is what makes everything about the Hitching Post operation especially appealing. 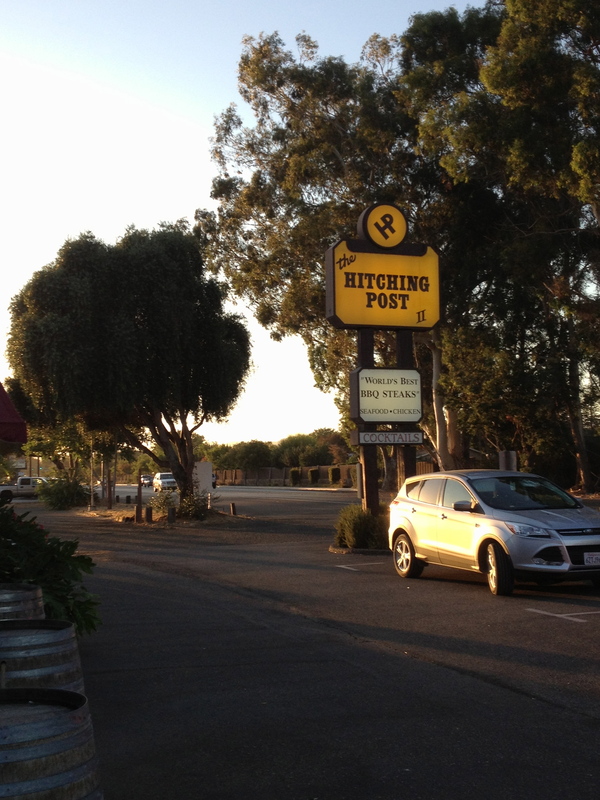 The Hitching Post Restaurant II is located on Highway 246, less than a mile from the Buellton exit of Highway 101 and the nearby wine tasting room is in the ultra-modern Terravant Wine Company, shared with other local winemakers. Stops at both should be part of any excursion to the breathtakingly beautiful wine region of north Santa Barbara County. This entry was posted on Thursday, September 26th, 2013 at 9:54 pm	and posted in Food, Travel, Wine. You can follow any responses to this entry through the RSS 2.0 feed.